Adolfo Foronda of Nerd Stalker interviews Michael Domaguing, Director of Product Marketing at Jumpstart. 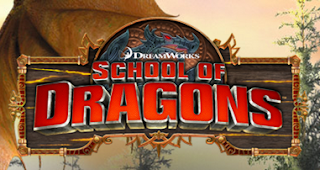 Jumpstart is featuring a 3-D MMO RPG game called "School of Dragons" based on DreamWorks animated movie "How To Train A Dragon". The game looks like a ton of fun, your kid can actually fly a dragon, multiple dragons really. Your child will recognize all the familiar characters from the movie. Believe it or not the game is free although there are monthly subscription options and in game purchase options. The game runs on the unity platform via any web browser (iOS and Android apps are coming) so no gaming hardware is needed. The game is ever-expanding and given that it is web-based you will see updates as they release them. At first we thought this was strictly entertainment but there is a science educational angle to the site as well. Under their resources section there are science worksheets, experiments, activities and a page on the scientific method. There is even an off-line component with coloring sheets, worksheets and more. Another great addition to the site is the additional information they provide on the design process. There are behind-the-scenes videos with designers and they even provide sketches from the design building process, fascinating stuff. We will provide a more extensive review soon, until then play the game and have a blast.